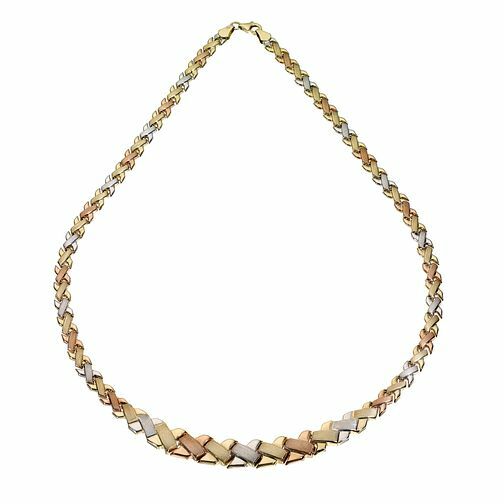 An elegant 9ct three colour gold mat and polished finish necklace with kiss crosses design. A stunning gift for the woman of your dreams. 9ct Three Colour Gold Kiss Necklace is rated 3.7 out of 5 by 3. Rated 5 out of 5 by Anonymous from A stunning necklace this was present for my daughters 40th birth day, she loves the necklace over the moon with it. Rated 5 out of 5 by Anonymous from Love, love, love it Gorgeous necklace. It looks fantastic on. I have only had it since Christmas so I cannot speak to the longevity of the necklace. I hope not to have the issues that the previous reviewer has mentioned.